None of this stops LoVallo, a native of Buffalo, N.Y., from being alert during his time on duty as a resident assistant for freshmen, even though that means at least one more late night each week. But it’s this kind of commitment and dedication that LoVallo thrives on at St. Bonaventure, he said. A little over two years ago, LoVallo walked up to a St. Bonaventure table at a college fair, curious because he had little knowledge of the university. And, thanks to alumni support to The Bonaventure Fund, he became a Bonnie and not a Golden Griffen. In the fall of 2015, he first began taking journalism classes, giving the major a shot because people had often told him he had a talent for writing. However, he said the professors in the Jandoli School of Communication keep challenging him. “The professors, although critical, do everything they can to help students become better writers and communicators,” LoVallo said. Of course, he gets lots of practice at The Bona Venture. Right after his arrival at St. Bonaventure, he began writing sports for the student-run newspaper and soon joined the editorial staff. Last semester, as only a sophomore, he moved into the managing editor position, second in command at the nationally ranked collegiate paper. 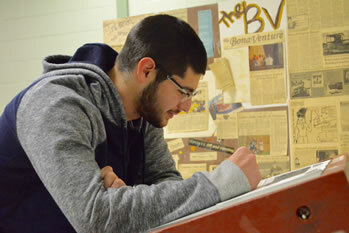 Next fall, he will lead the paper as its editor-in-chief. But despite his packed schedule of writing, editing and coaching his young residents, he said he knows he can always count on his tight-knit group of friends to keep his St. Bonaventure experience exciting. Although only in his second year, he said he’s already busy thinking about his communications career. While he’s building a solid foundation in print journalism, LoVallo said he hopes to one day work in broadcasting. Maybe St. Bonaventure should watch out.